Looking for a Nutrition Program? 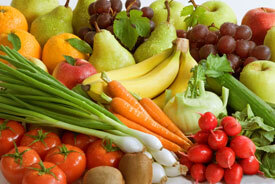 At Rockwall Health Center, we believe that food is one of the greatest medicines that exists. Instead of just helping patients achieve their best health possible through an improved diet, Dr. Jamal, a Certified Clinical Nutritionist, goes a step further to educate and help patients understand the important role that nutrition plays in their life. When the body is not receiving the nutrients it needs, not everything works as it should. Nutritional imbalances can lead to a wide variety of problems, including stress and anxiety, low energy levels, muscle aches and body pains, headaches and much more. Food is one of the greatest medicines that exist. During your first visit with Dr. Jamal, it is common to undergo nutritional tests to discover if you have any imbalances that could be contributing to the way you are feeling. When a nutritional imbalance is discovered, Dr. Jamal will help craft a unique dietary plan that complements your chiropractic adjustments. His dietary plans also help with patients who want to lose weight. With both natural methods working to bring wellness and balance to your body, it is possible to unlock your best health yet and get back to living life to the fullest. Because patients may find it difficult to incorporate certain food groups into their diet that they may not be used to consuming, Dr. Jamal may recommend supplements by Standard Process. These natural, whole food supplements are as close to the real thing as you can get! It is extremely common for patients not to realize how a holistic nutritionist can benefit their overall health. In his many years of practice, Dr. Jamal has seen many patients improve their lives with his suggested dietary changes. If you would like to see more nutrition reviews you can go here. If you typed “Nutritionist near me”, then be ready to take control of your health! Contact our office today to learn more about how nutrition and dietary changes coupled with chiropractic care can optimize your health. You deserve to enjoy life, and we can help!